The gentle scent of the tatami floor and the tweets of the birds in the garden are our alarm clock, while far in the distance the mountains are getting out of the misty blanket brought by the night. When we reach the kitchen for our breakfast, usually based on toasted bread with jam, tea and some yogurt that we buy the day before, the lady offers us, as osettai, to try some onion soup she has been making. The idea might seem weird, at least for those like us more used to a sweet breakfast, but when we sip the first spoon we are surprised by a pleasantly sweet taste that has nothing to do with what we would associate to onion. When we are done with breakfast and getting ready to set up our bikes, we give her our small osettai and express our gratitude for her caring hospitality and for the nice talk. We also inform her that we have decided to leave our two rain suits as osettai for any henro who might need them, and we place them in the rest hut built next to the house. Those rain suits have been pretty useful during our last day of cycling under the rain, and we have also considered taking them back home. At the end we have decided that they will be better used here, as for sure there will be many henroes caught by the rain in the coming rain season. Immediately after having placed the suits in the hut we are reached by a man, a lady's relative if I remember correctly, and he gives us two hakui. We are astonished by such present, and we gratefully accept them. We didn't buy them when we started our trip as we were not sure they would be comfortable while riding, but we are so happy to have received them that we put apart any consideration about comfort and wear them. We wave goodbye to our hosts and get on the road. 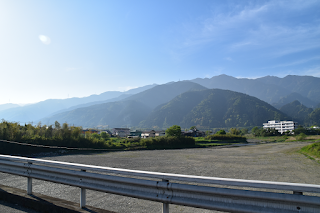 Initially the landscape is pleasant, with sparse houses and the mountains on our right, but when we reach the coast and we venture into Shikoky-chuo city the landscape becomes really unattractive: loads of industries (paper making industries, according to the route guide) on our side, metal pipes and fenced areas for kilometers, trucks and traffic all around. When we finally have the possibility to reach more secluded area we take is as a blessing. During our first stop at a convenience store a young man greets us at the entrance, and few minutes later gets out and gives us two bottles of sport drink, osettai for us. It's the first time we are given an osettai on the fly, and we are pretty sure the hakui we are wearing plays a big role in this. 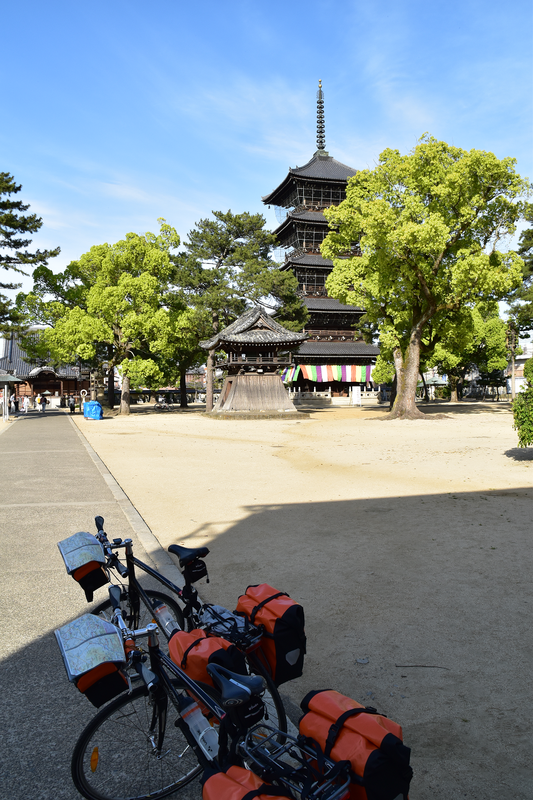 We thank the man giving him a osame-fuda, and start cycling among the houses heading to temple 67. 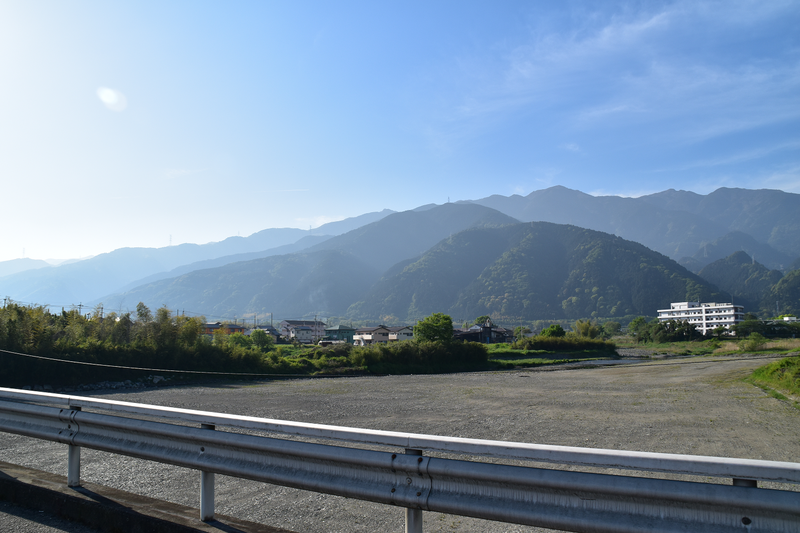 The steep climb we have to do before reaching it through a road winding among rice fields is really pleasant after the sad hours spent across the industrial area, and in the parking lot we are again approached by an old man who gives us some candies as osettai. 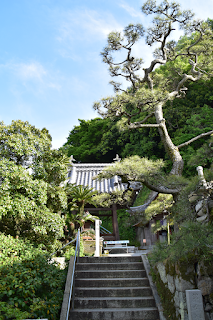 The large camphor tree at the bottom of the stairs leading to the temple is impressive, and we spend some time on the temple ground enjoying the sun. From there we move on to the next temples, and we reach temple 70 at about lunch time. We decide to stop at the Inari park just outside the temple, where a group of elderly people is playing croquet on the grass. Watching them during the game is entertaining, and they also seem to really enjoy their time. When they stop to drink some tea while chatting and laughing, we enter the temple and find that its main building is wrapped into a frame for some restoration work. We then set again on the road, heading to Zentsuji city for the last temples of our trip. 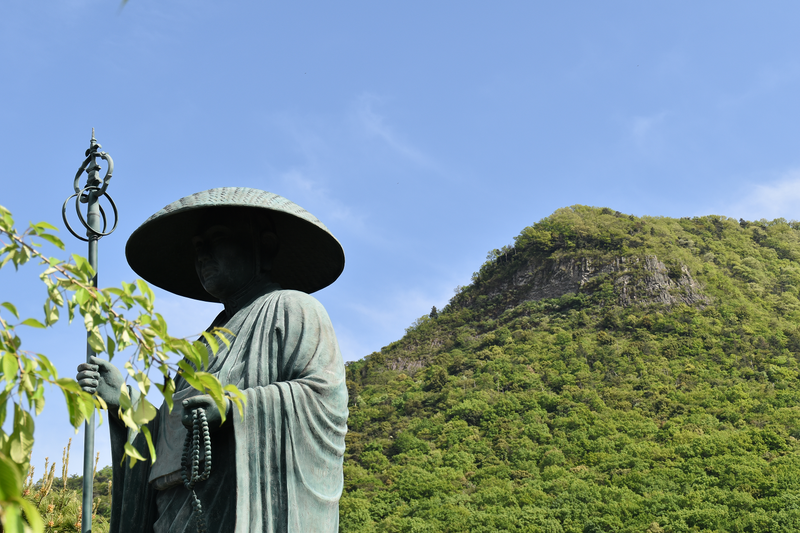 A short climb to the Tossaka-toge pass takes us there, and we first reach temple 72. There, while my travel mate decides to wait at the temple, I continue to temple 73. While I am locking my bike near the parking lot I am approached by a couple of Japanese henroes, who ask me where do I come from. 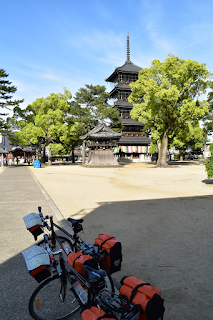 They explain me that they are also cycling the Ohenro-san, but they are doing it counterclockwise and on folding bikes, with their luggage shipped daily from one lodge to the another. 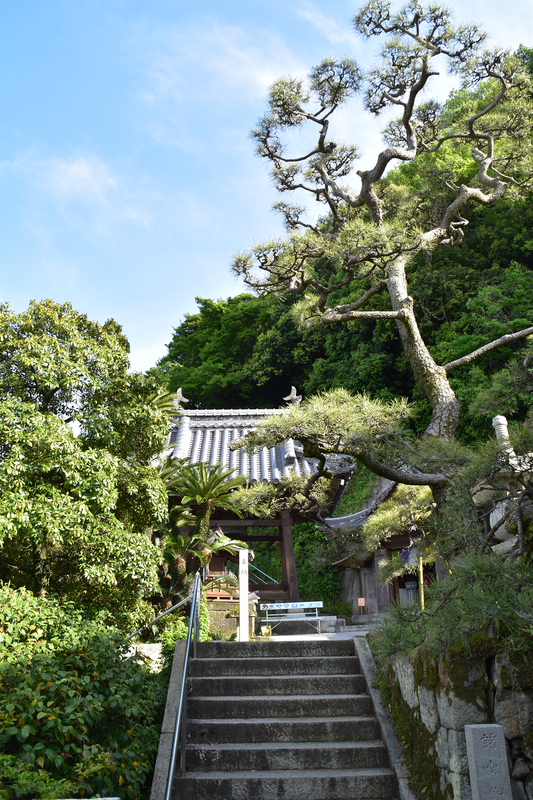 After they leave I proceed to the temple, and on the stone stairway I buy some mikan from a honesty shop placed on the side. 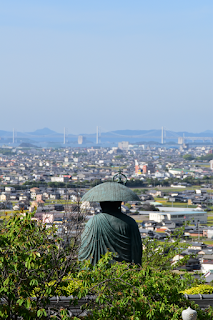 The statue of Kobo Daishi looking over the city is probably the metaphor of the relationship between the holy man and the island of Shikoku. Upon reaching back temple 72 I meet my wife talking with the cycling henroes I met earlier. To our surprise, they are spending the night at Kazeno kuguro, and we tell them they will surely enjoy the place. We greet them and move forward across fields of ripe rice shining like gold under the sun of the late afternoon. We easily lose our way in the maze of small streets, but the farmers spread across the field don't even need to be asked and provide directions to us for reaching temple 74. When we enter we are the only ones visiting it, and we can enjoy the warm atmosphere of a silent temple. Though we are in the very same city where we have started our trip, we still haven't found anything familiar along our way. 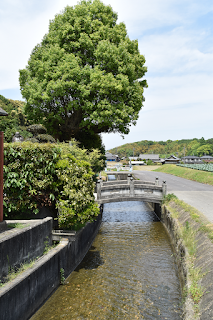 We depart from Koyamaji and dive again in the small streets to reach Zentsuji. Also here we have to ask indications for the temple, but again it's easy to get them. When we enter the temple the outside is calm as normal in the minutes before the closing hour, with some pilgrims hastily walking to reach the halls in time, but within our minds fireworks are popping in the sky: we have done it, we have completed the loop! We just hug ourselves and take some breath while looking at the buildings, finding it a familiar place, where 17 days ago, in a early Sunday morning, we have moved our first clumsy steps. 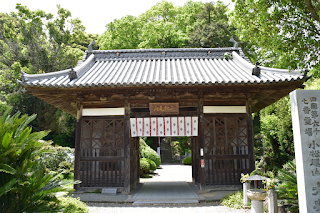 After taking some picture we get close to the Daishi hall, where a group of monks is praying. We also offer our pray and thank for having had a safe trip, while half joking, half seriously, I ask "do we really have to stop, or can we take another round?". The answer takes longer than some time to get out of my travel mate's mouth, and this surely means Shikoku byo has taken us. We cycle until Kazeno kuguro, where the owner is glad to see us back. He is talking with the cycling henroes we have met at temple 72, and is surprised when we tell him we already met. We take a celebration picture with him, too, and he again apologize for not having a room for us and ask if we have found an accommodation for the night. We tell him that no excuses are needed, and that we have managed to find a place to stay. After taking our bags we bid him farewell and we get back on our bike to reach the hotel for the night. 17 days, 1249 km and 80 hours of cycling later we have closed the loop of our pilgrimage. When we look back at these days we quickly promise ourselves that we will be back again, and the next time without skipping any temples and taking more time to also better enjoy what comes together with the pilgrimage: meeting people and share experiences.